Summer brings warmth and color back to our gardens. Add sizzle to your containers and borders with annuals and perennials at the peak of their glorious color and trees and shrubs in all their green leafy splendor. What a comeback! Summer annuals are taking center stage after a long cold spell. Gardeners are seeking out classic annuals and perennials but in new and improved varieties. Trees and shrubs are leafed out and blooming. Summer color? It’s our specialty! Shady Characters: We love shade gardens in the PNW. Coleus, begonias, hostas, forest grass, brunnera and all kinds of impatiens create a jungle-like vibe for those of you lucky enough to have a garden spot out of the summer heat. We are watching the night time temperatures so we can plant our beloved tomatoes. Read about Northwest Tomato Growing Tips. Find your favorite go-to varieties or try an heirloom. Not a fan of the red guy? We have tables full of fresh herb and veggie starts, all organically grown. We love color and low maintenance, so why not choose drought tolerant plants? Drought tolerance is determined by many variables including how/where the plants are grown. Typically, drought tolerant plants are those that can handle reduced watering once they are established in the garden. They will need regular watering (maybe once or twice a week) for the first several months. Remember, even under dry conditions, some fertilizing keeps plants looking good. As you can guess, most drought tolerant plants are also heat tolerant. Reduce your water bill and increase your leisure time by including drought tolerant plants in your landscape. You can have shower of color during our hot dry summers! LATE SUMMER TIP: Missed starting your planters from scratch? Transplant a colorful hanging basket into a deck pot for instant fullness. If you need help, ask us for ideas or take advantage of our potting services. Read more about these SERVICES – Container Design & Potting. MOTHER’S DAY: Buy a gorgeous fuchsia basket for/with Mom that is as special as she is. Bellevue Nursery also offers vibrant begonia baskets, as well as lush hanging gardens, overflowing with long-lasting color. Put together a colorful plastic trug filled with tools, fertilizer, soil and gloves. We also offer Bellevue Nursery Gift Cards ~ no expiration date on purchases or appreciation for all she does for us. Remember to thank Dad in June with a special tool or plant so he can get as down and dirty as he likes! 4th OF JULY: Fireworks aren’t relegated to the summer sky! 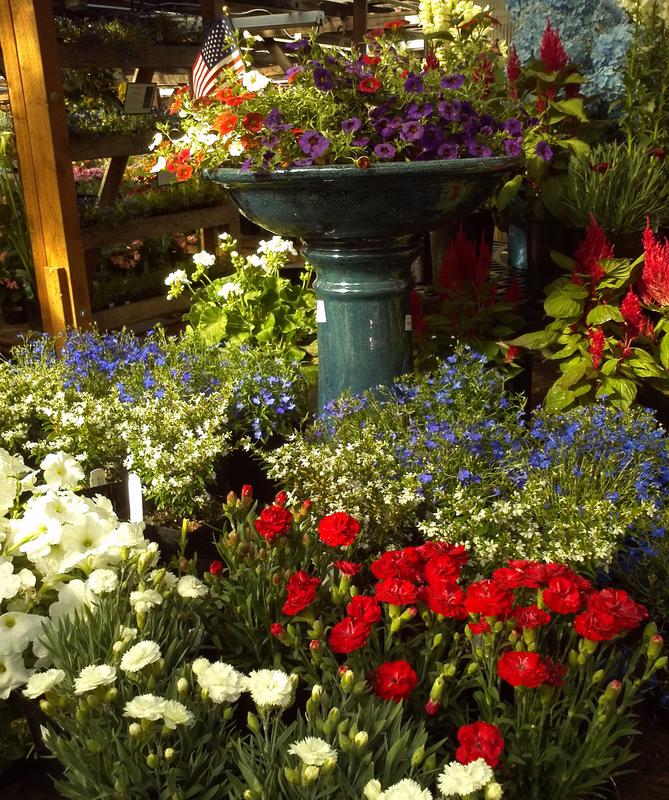 Annuals and Perennials are in full bloom with the official start of summer. Have fun with combinations of red, white and blue flowers and foliage for a celebratory welcome to your home. SEAFAIR: Speaking of official starts, there’s always some fun activity or event going on in summer, whether it be the hydroplane/milk carton races, parades or airshows. This is the perfect time to refresh those deck and patio planters for outdoor entertaining or just kicking back. See our SUMMER CHECKLIST for more information.